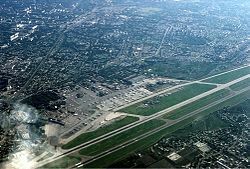 فرودگاه بین‌المللی تاشکند (به ازبکی: Toshkent Xalqaro Aeroporti) یک فرودگاه همگانی با کد یاتا TAS است که یک باند فرود بتن دارد و طول باند آن ۴۰۰۰ متر است. این فرودگاه در شهر تاشکند کشور ازبکستان قرار دارد و در ارتفاع ۴۳۲ متری از سطح دریا واقع شده‌است. ↑ "НОВОГОДНИЙ ПОДАРОК ОТ АВИАКОМПАНИИ". Kyrgyzstan Air Company. Retrieved 18 January 2013. ↑ "ПРЯМЫЕ РЕЙСЫ В ТАШКЕНТ ИЗ ЧЕЛЯБИНСКА". АвиаПорт.Ru. 6 August 2012. Retrieved 6 August 2012. ↑ "Uzbekistan Airways Resumes Lahore Service from late-July 2016". airlineroute. Retrieved 7 March 2016. ↑ "Открытие рейса Ташкент - Минск переносится на июль". Авиационный сайт в Беларуси. MSQ.BY. 24 May 2015. Retrieved 27 May 2015. ↑ L, J (18 December 2014). "Uzbekistan Airways Adds Minsk Service in S15". Airline Route. Retrieved 18 December 2014. ↑ L, J (6 May 2016). "Uzbekistan Airways Adds Voronezh Service from June 2016". Airline Route. Retrieved 6 May 2016. ↑ "2013 summer schedule". Aero Logic. Retrieved 13 August 2013. ↑ "НОВОГОДНИЙ ПОДАРОК ОТ АВИАКОМПАНИИ". Kyrgyzstan Air Company. Retrieved ۱۸ ژانویه ۲۰۱۳. ↑ Liu, Jim (8 فوریه 2017). "Uzbekistan Airways plans Lahore resumption in S17". Routesonline. Retrieved ۸ فوریه ۲۰۱۷. این صفحه آخرین‌بار در ‏۵ ژوئیهٔ ۲۰۱۸ ساعت ‏۲۲:۳۸ ویرایش شده‌است.